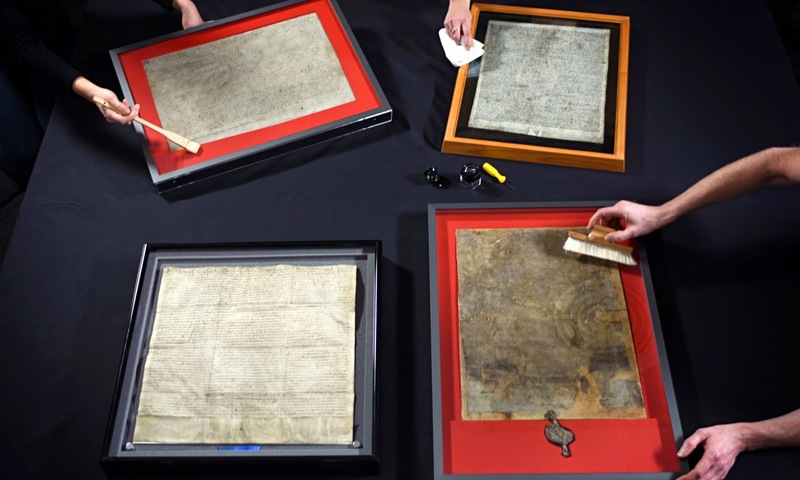 Four surviving original copies of the Magna Carta are on display in London as Britain begins 800th anniversary celebrations of the globally significant contract. Considered the cornerstone of modern democracy, liberty, justice and the rule of law, the 1215 English charter forms the basis for legal systems around the world, such as the Universal Declaration of Human Rights and the US Constitution. About 1,200 people, drawn from a ballot, have won the chance to see the unification event at the British Library, which brings together its two originals with those of Lincoln and Salisbury cathedrals. The four parchments will then be on private display in the UK parliament, marking the start of a year of celebrations for a document that still has resonance eight centuries later. "No free man shall be taken or imprisoned or disseized or outlawed or exiled or in any way ruined, nor will we go and send against him except by the lawful judgement of his peers by the law of the land," the document states in Latin. "To no one will we sell, to no one will we deny or delay right or justice." In June 1215, the wayward King John agreed to the demands of rebellious barons to curb his powers and sealed the charter at Runnymede, a meadow by the River Thames west of London. Although nearly a third of the text was dropped or substantially rewritten within 10 years and almost all the 63 clauses have been repealed, Magna Carta principles have become "a potent, international rallying cry against the arbitrary use of power", the British Library said. One of Britain's Supreme Court judges, Anthony Clarke, said it was still important for governments seeking a balance between issues of security, individual rights, the rule of law and the "principles of justice that lie at the foundation of society". He said the principles that justice should be available to all, the law applies to all equally and leaders can only exercise power in accordance with the law continue to be fought for in many parts of the world. Magna Carta Trust, which looks after the memorial site in Runnymede, said the charter's importance was growing. "800 years on, Magna Carta's best days lie ahead," it said. "As an idea of freedom, democracy and the rule of law, it is lapping against the shores of despotism. "The principles set out in Magna Carta have driven the Arab Spring and the continuing protests against despotism around the world." 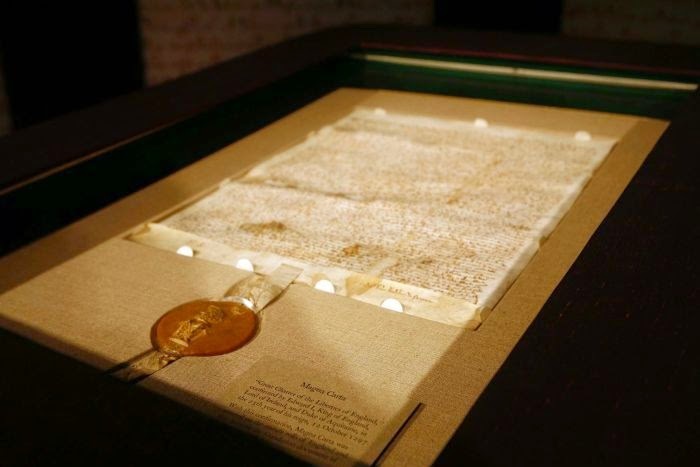 The principles of the Magna Carta extend well beyond the world's common law jurisdictions such as the United States, India and Australia which inherited England's legal system. Lawyer David Wootton, a former lord mayor of London, said English law was the "common currency" of global business deals precisely due to the protections derived from Magna Carta. "Investors regard their money as safe here (in London) because of the protections in the legal system," he said. "There is a close relationship between economic development, societal development and the quality of a country's legal system." Events are being staged across Britain throughout 2015 to mark the anniversary, including a major international commemoration event at Runnymede on June 15. Exhibitions, debates, conferences, church services, lectures, charity dinners, theatre performances, tourist trails, village fetes, and even a national peal of bells are being staged. There will also be a mock trial of the barons who forced the creation of the charter in parliament's Westminster Hall to debate whether they were guilty of treason.